This is one of four posas, or small open chapels, at San Miguel, Huejotzingo, a Franciscan monastery in central Mexico. The crenellated wall, which forms the boundary of San Miguel’s open courtyard, reveals how the posas marked the corners of the courtyard. 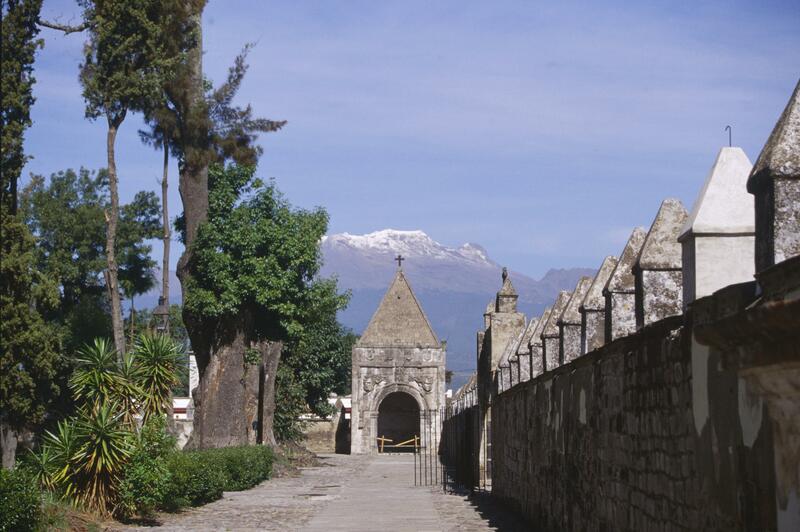 The posa aligns with Iztaccihuatl, one of the two great volcanoes to the west. Pre-Hispanic sacred architecture often aligns with mountains, and the importance of such an alignment would not be lost on indigenous observers. This posa originally held an altar and would have been visited as part of a processional route celebrating Christian holidays. At right is the wall around the church courtyard. 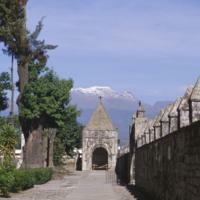 The gate allowed passage between the mundane world of the city of Huejotzingo and the sacred space of the monastic complex. The crenellations of the wall lend a military feel, which was common to central Mexican architecture built in the 16th century, but they did not serve a military function. As sites visited along a processional route, posas were not merely part of church complexes, they were integral to Christian ritual. From the view in this photograph, it is possible to see how the walls of the courtyard, the landscape and the posa served together as frame for religious rites.